When Petsy, a pet supplies e-tailer, wanted to make sales on Facebook, they turned to Vionic for help. Petsy was looking to attract new clients and generate revenue strictly on Facebook. Create a customized Deal campaign on Facebook using Vionic’s Deal Maker Pro. Petsy was looking for a new way to attract clients and make sales on Facebook while increasing their fanbase. Petsy created a Deal campaign using Vionic’s Deal Maker Pro application. 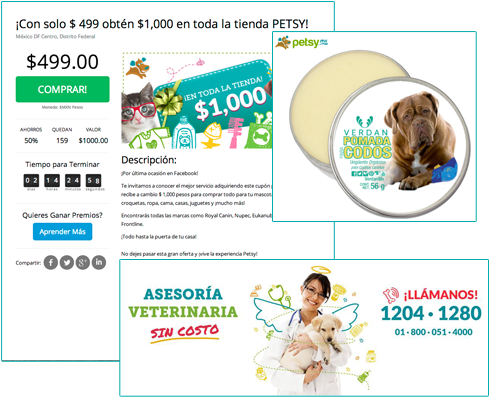 The Deal offered new customers the chance to purchase $1000 MXN worth of product on Petsy’s website for $499 MXN. To access Petsy’s Deal, Facebook users had to Like Petsy’s Facebook Page. After 2 full weeks, Petsy had sold 45 Deals, generated $22,455 MXN in revenue, and gained 328 Facebook Likes using Vionic’s Deal Maker Pro!